Looking for a new dog bed, but just don’t know what to buy? Look no further. The eLuxurySupply dog bed has arrived. eLuxurySupply is a company that has been producing quality bedding products at affordable prices for years. Will the eLuxury dog bed stack up as well as their other products? Continue reading below to find out! Let your furry best friend sleep in the lap of luxury with this cozy dog bed from eLuxurySupply! Enjoy 30% off your purchase with code SleepopolisReview! The eLuxurySupply dog bed is more than just your typical pet bed. Through experience, I can assure you that your pet bed is going to get dirty. With this dog bed, that’s not an issue. eLuxury designed a fully removable cover, made from 100% cotton that is both machine washer and dryer friendly. In addition, the inside of the pet bed has a waterproof protector surrounding the actual foams of the dog bed. This helps prevent dirt, urine, or other mess from ever penetrating the foam layers. As you unzip the cover, the materials inside are some of the highest quality Sleepopolis has seen to date (with regards to a dog beds). 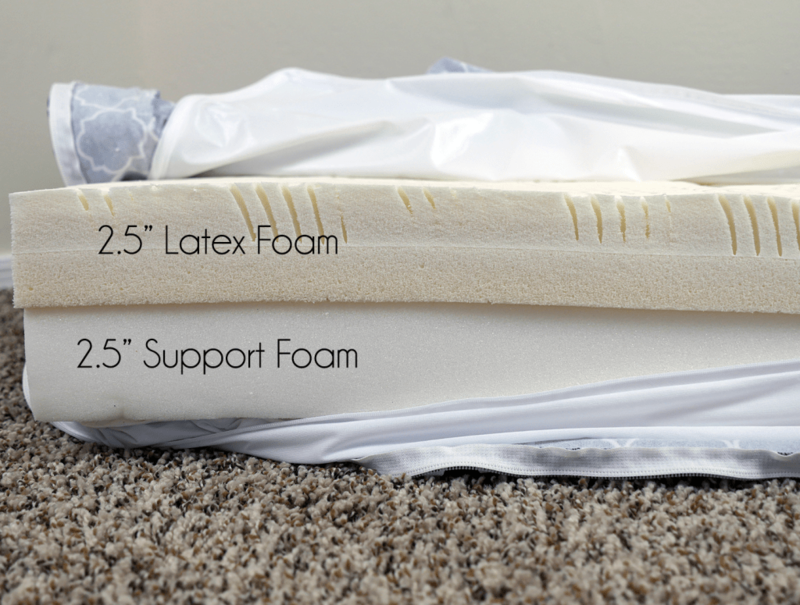 There is a 2.5” layer of continuously poured latex foam (it’s very similar to Talalay latex) on top of a 2.5″ layer of base foam. The latex has a density of 3.43 PCF (pounds per cubic foot) and the base layer has a density of 1.5 PCF. With the combination of these two foams, the bed offers great pressure relief and comfort for our pets. 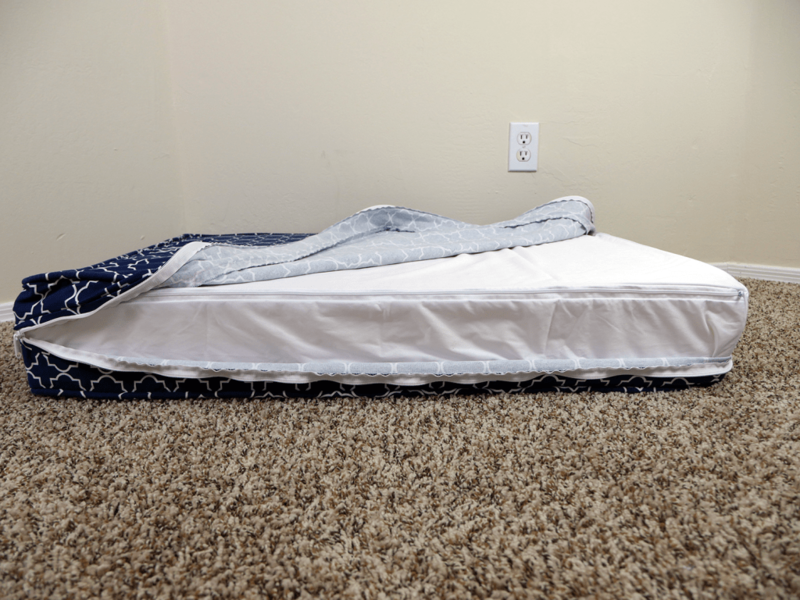 Additionally, the dog bed is flippable, offering two different firmnesses depending on what your pooch prefers. This allows owners to make the adjustment based on their pet’s age, size, or preference. eLuxury has really gone above and beyond on the construction and material quality. 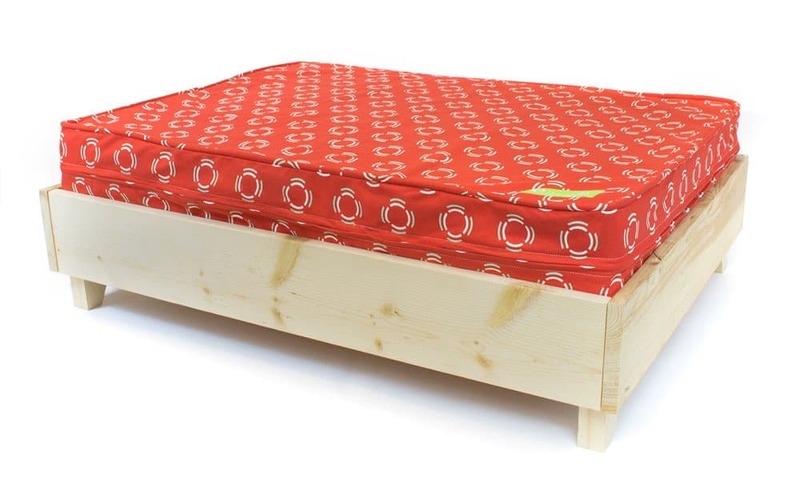 The materials used in this dog bed are similar in performance and quality to many human foam mattresses. The comfort of the eLuxury dog bed is remarkably good. It’s easily as comfortable as some human mattresses I have previously tested. Another unique feature with eLuxury’s dog bed is their matching platform bed (not yet released, coming soon). eLuxury is working to to create a platform bed, similar in style to their full size platform bed. This gives our furry friends the option of sleeping a little higher off of the ground. We all know how much our pets like to climb up onto the couch or better yet, our mattresses. With this new platform bed our pets will feel as if they are own their own personal throne. 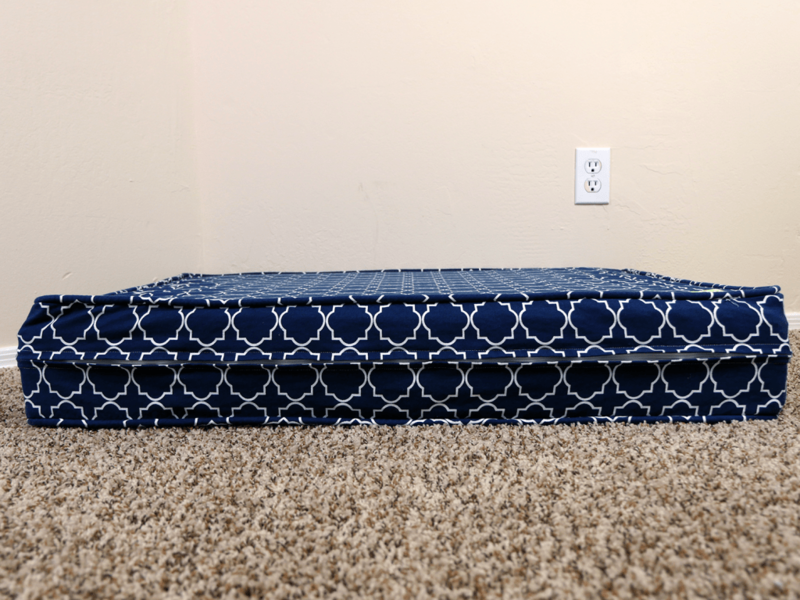 eLuxurySupply dog bed platform bed – coming soon! When examining pet beds, the most important topic is durability. To test the durability, I thoroughly examined a few areas before allowing my dog (Tibbers) to test out the bed. After analyzing the stitching, I was very impressed. There were no flaws whatsoever. Next up, the zipper. Again, very impressive. The zipper was easy to use and never once got snagged on the cover’s materials while removing or replacing the cover. Finally, it was time to let the newest member of my family, Tibbers, lie on the bed. Tibbers is a standard Poodle (albeit a small one at 27 pounds) who loves digging into her sleeping spot…be it her dog bed or my couch :( Time and time again she tried to dig her way through this bed to get that perfect comfort. The exterior cover did a great job of preventing damage, as did the interior foam protector and foam layers. Even after several weeks of use and digging there has been no discernible damage or wear / tear. Overall, the eLuxury dog bed feels and looks very well made. All things considered, the eLuxurySupply dog bed is extremely nice. The overall performance was impressive and Tibbers seemed to enjoy her her daily naps, bone chewing, and evening slumbers on it as well. Durability – can it take the beating that your dog is likely to put it through? Cleaning – can I easily clean it once it gets dirty? Style – does it look nice and match my room? Materials – is it made of quality stuff? If I was designing a dog bed, this is basically the exact dog bed I would design myself. The eLuxury dog bed just hits the nail on the head in every single one of these categories. Through digging and bone chewing Tibbers put the eLuxury through a healthy workout. Even after several weeks of use the bed looks as good as it did out of the box. On the cleaning front you have a removable and washable / dryable cover + an internal protector, check and double check. For style, the dog bed is available in 7 different styles, colors, and 3 different sizes. Lastly, material quality; the materials used are on par with the same types of materials that would actually be used in a human mattress. 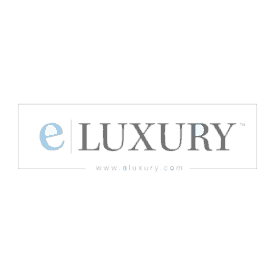 eLuxury didn’t cut any corners and didn’t skimp on quality or performance in any area. It’s a great designed dog bed. It’s tough. It looks great. It’s easy to clean. And it’s not insanely priced. Bottom line...this is the best dog bed I have tested to date by a healthy margin and I expect it will remain so for some time. For more information on the eLuxury dog bed visit eLuxurySupply.com. 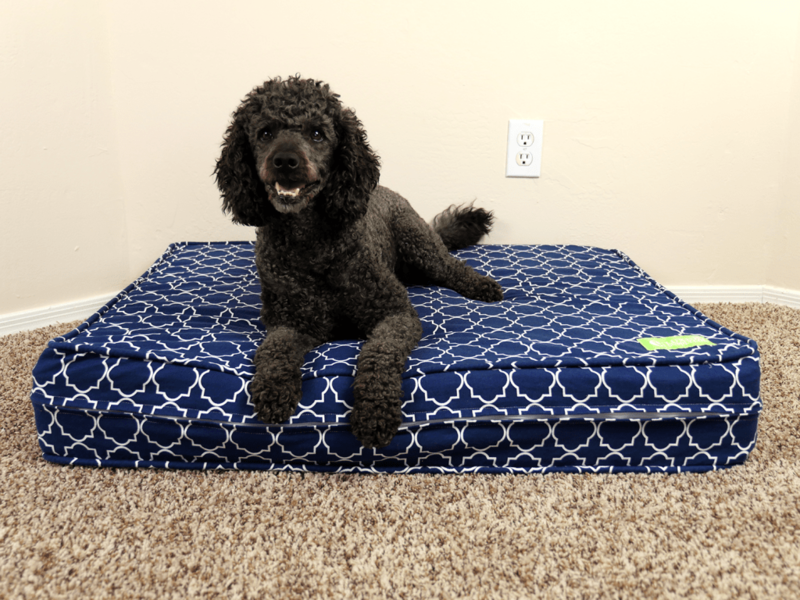 The eLuxurySupply dog bed is changing what a great dog bed is supposed to look like. An extremely durable washable cover, quality material design, liquid proof protector, and flippable firmness levels have made eLuxury’s dog bed one of the most impressive to date. If you’re in the market for a new bed for your furry friend, eLuxurySupply is a great option. It’s everything your pet, wallet, and room design need.